The music of Vijay's Thalaivaa would be released a day earlier than previously planned. 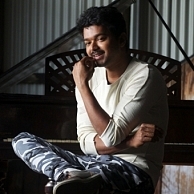 Now, fans would get to listen to the music from the 21st of June, as a pre-birthday treat from Vijay. It is not clear yet if there would be a grand formal launch of the music, to coincide with Vijay's birthday on the 22nd. There are 6 tracks in the movie, composed by G.V.Prakash and his association with director Vijay is already among the celebrated combos in the industry thanks to their proven track record. Vendhar Movies is planning to release Thalaivaa in a grand manner in July.